I'm still chugging away on "Mark II." I've had a lot of real (IE: Paid) work this week, so I haven't been able to put as much time in as I'd like in nailing out the last bits of the layout. On top of that it's been trying time for me when it comes to relationships. All in all, I haven't been much in the head-space for web design this last week. What I have done is get a simple portfolio layout set up and decide that I need to rework my entire navigation system... so yeah. Fun stuff. I hope I finish it soon. Like tomorrow. We all have our hopes and dreams. Additionally, I offered to help a friend of mine come up with a design for his website, so I'm planning on throwing some of my time at that too. How come I always get crazy busy when I offer to do something like this? Ah well. It should look good in my portfolio. Since my website is coming so slowly, and I don't have any pretty pictures to show for it, I figured that I'd post some of the drawings that I did for my summer classe. 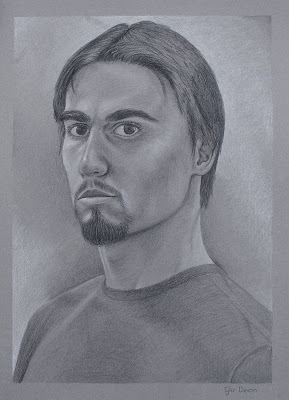 The self portrait I did as a final project. Done with black and white prismacolor pencils against grey paper. My second to last project. Done with charcoal in about 8 hours. One of my earlier drawings. We were practicing contour drawing. This was done over two or three class periods.